Yesterday I spent catching up on sleep.Â I’ve been pretty stressed out the last week about a Major Life Decision coming up – unfortunately I don’t have enough data to make that decision yet, but it should resolve by the end of next week.Â I hope. 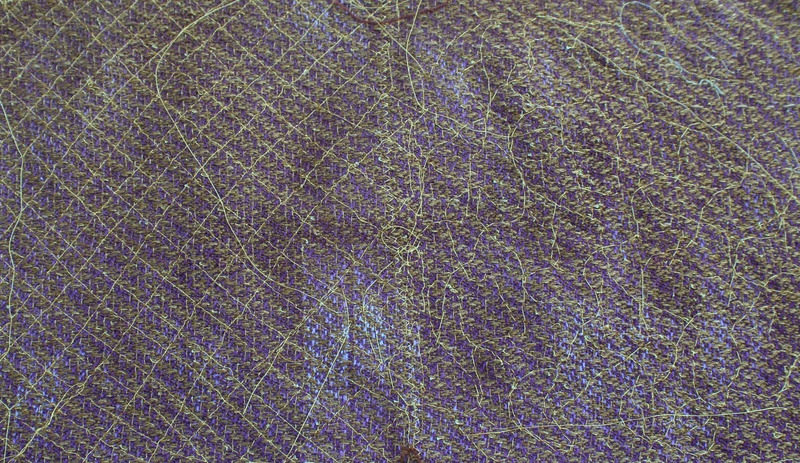 I feel that the mesh as it stands is not stable enough to work in a garment; if you snagged it just once, the whole thing would fall askew.Â So I have been testing out ways to stabilize it.Â Trying to stitch after burnout turned out a mess; even using two layers of wash-out stabilizer, one on top and one on bottom, the mesh still distorted.Â It didn’t help that I was using clear monofilament machine embroidery thread, which stretches, pulls out, and does all sorts of untoward things when sewn over delicate fabric.Â So I switched to the gold embroidery thread, and stitched two sections: one with a diagonal grid and one with a semirandom, vaguely diagonal grid.Â This is what you see above. Both sides are quite stable and much less subject to snagging; the diagonal mesh is more stable than the semirandom one.Â I think having straight lines and more intersections adds stability. The downside is that this method of stabilizing requires a LOT of sewing, and I feel that the diagonal lines look very rigid.Â I think that, if I have to use diagonal lines, I will embroider over the grid with some thicker gold thread in swoopy gusts (think autumn winds) before burnout, in an effort to reduce the visual impact of the grid. Off to the farmer’s market!Â Later today I will dye my knitted blanks, so I can get back to weaving tomorrow.